Inca Project Supervisor Daniel O'Shea updates us on the latest news from the Inca Projects. Inca Trail - As always the volunteers on the Inca project have kept up their hard work on keeping the Inca Trail in Sicre (not far from Huyro) clear of vegetation. 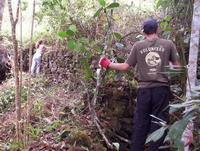 The volunteers have been working with machetes and pruning sheers to carry out this work. The work aims to protect artifacts which may be present on and around the Inca Trail. Cochapata Mountain - Volunteers took another few day trips up the mountain and into 'sector 3' of our explored areas to search for more Inca ruins. Although there was not as much found as on some previous trips, any structure that was previously unknown was recorded by means of GPS. This information is then relayed to the INC (National Cultural Institute) via our resident archaeologist Jhon Valencia. The cleaning and clearing of ruins continued in Sectors 1 & 2. Incatambo & Amaybamba - Our close relationship with the INC had enabled us to visit and help maintain previously restored ruins in Incatambo. Volunteers also got the opportunity to visit and help clear ruins in Amaybamba. It was only after a local farmer approached the local INC watchman about ruins on his land that we were made aware of these structures. There will be more exploration and field work programmed in the future in this area. Visit to Te Huyro and Huaymanmarca - Volunteers were taken for an afternoon tour of the local tea factory. Although it is not running on full capacity and hasn't been for many years the volunteers got the chance to see how the tea manufacturing process works from picking the tea leaves to seeing the tea bag being boxed. Volunteers also got the opportunity to visit Huaymanmarca, an Inca sacrificial site not too far from Huyro. Community House - The main development in the community house this month was organizing an 'Archaeology Area'. This included putting up maps and a white board where our archaeology lessons can be held. We also arranged our books into an archaeology section. Archaeology Lessons - The lessons with our resident archaeologist Jhon Valencia have included 'an introduction to archaeology', 'ceramics', 'Quipus' and general 'question and answer time' regarding Inca and pre-Inca cultures. Sports - With school starting up again in March we have been able to arrange local soccer matches between the teachers in the local schools and the volunteers on the Inca project. There is also the opportunity to play volleyball with the locals too. It really is a great way to get to know the local people and to practice Spanish. Volunteers also have access to the local outdoor swimming pool at Huyro sports center. Inca Social - All the Inca volunteers were treated to a half week in Cusco where they got to visit a few Inca sites including Raqchi, Sacsayhuayman and Q'enko. Projects Abroad arranged free entry to all the sites through the INC.
Volunteer Social - This was held in Urubamba and all the Inca volunteers attended along with other volunteers from Teaching, Care and Sport programs. The evening included a buffet meal for everyone and afterward all enjoyed a few games of 'sapo', a popular Peruvian game.